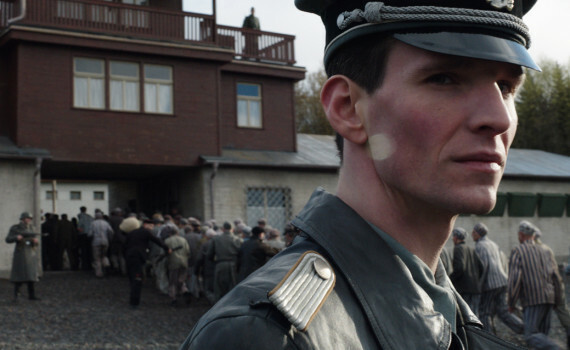 There is no more compelling true story of our planet’s past than WWII and its Holocaust. Perhaps because it is still fairly recent, perhaps because so much of the world was involved, perhaps because there was such a clear evil to fight. But whatever the reason, we don’t seem to tire of stories from this war, especially those connected to the Jews and their decimation during the time of the SS, ghettos, and concentration camps. I’m not sure we’ll ever be too callous to empathize with this plot, these unbelievably real events, nor will be ever forget the terror that humanity is capable of. That said, not every Holocaust film can meet the same standard, and Naked Among Wolves relies on our prevalent emotions more than solid filmmaking, resulting in another stirring story but not the greatest movie. Only weeks away from the end of WWII, with American & Russian forces closing in on Nazi troops from all sides, the work camp of Buchenwald is a place of concealed dramatics and quiet struggles for survival. A young man who found himself a lucky prisoner with a little privilege, one who has a job at the camp that keeps him in a position of small authority, now finds himself the unlucky discoverer of a terrible secret. A three-year-old has been hidden in an incoming suitcase, with reporting such an assured death sentence for the lad. But not reporting it would be even more disastrous, as the prisoners are planning an armed resistance for when the end of the war comes, something that they can’t jeopardize for the sake of one young life. Naked Among Wolves is a unique look inside a concentration camp, not only for its timing, but also for its vantage point. Set at the end of the war, every prisoner knows that there are only weeks left, that either the guards will kill them all when American tanks come rolling in or else they will be set free. Feeling that weight, and also seeing the German commanders’ points of view, is an interesting way to envision an awful era in history. But we also get to see prisoners as workers, in the way of trustees, earning trust & privilege while still under the threat of death at all times. Adding the boy into the mix upsets a delicate balance, and that element launches us toward the climax. The only problem I had with the film was the lack of excitement when that climax came, and a sense of redundancy leading up to the final scene. The film wasn’t deftly done, it more relied strongly on our fascination with the topic and an original viewpoint of history, becoming good but not wonderful.